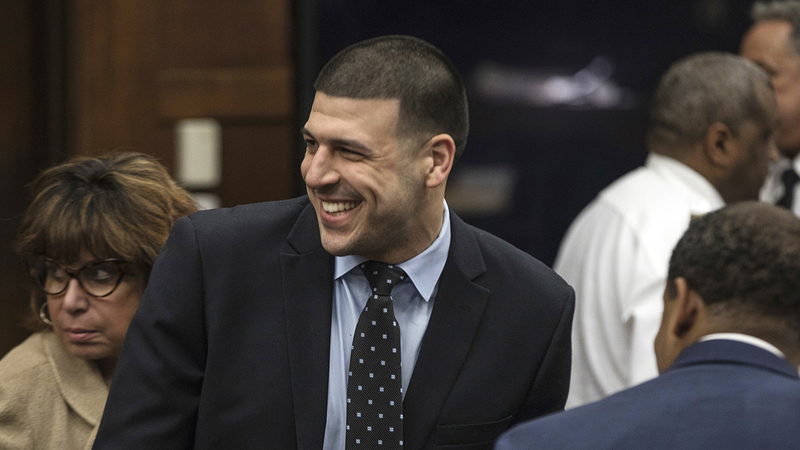 BOSTON -- Ex-NFL star Aaron Hernandez, who is already serving life sentence for 2013 murder, was acquitted Friday in a 2012 double slaying prosecutors said was fueled by his anger over a spilled drink. The former tight end for the New England Patriots wept quietly as the verdicts were read in Boston. Relatives of the victims sobbed loudly. Hernandez grew up in Bristol, Connecticut, and played for the Patriots from 2010 to 2012. About six weeks after Furtado and de Abreu were killed, Hernandez signed a five-year, $40 million contract with the Patriots and went on to play another season before Lloyd was killed. He was cut from the team shortly after he was arrested in Lloyd's killed in June 2013. He was not charged in the 2012 killings until 2014.